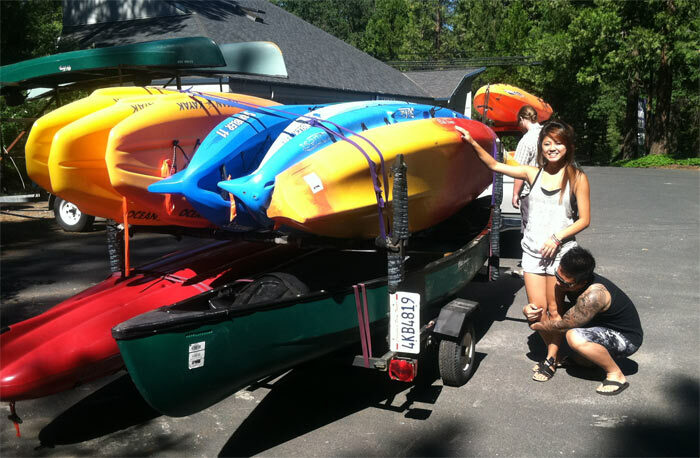 Transporting & Trailers | Sierra Nevada Adventure Co.
Transporting kayaks and canoes is easy! Whether you are renting one boat or twelve, we have everything you need to get your kayaks and canoes to the water safely. Most factory racks are sufficient if you are renting one/two kayaks or a canoe. If you are renting more than two boats and have only one vehicle, a trailer may be the answer. 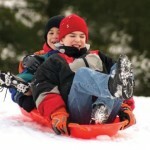 We have several trailers available, the largest of which carries eight canoes or twelve+ kayaks. Trailers make it easy to load! If you are just renting one boat and have no roof rack of any kind, we offer soft racks at no additional charge. Soft racks are foam blocks that rest on your cartop and allow us to tie the kayak or canoe on top of the vehicle. Extend-a-truck bed extenders are a great way to go if you are carrying long boats in the back of a pick-up. Trailer Rental Requirements – To rent a kayak trailer you will be asked to sign an additional waiver and you will need to provide proof of auto insurance (since liability is on the driver). The vehicle that will pull the trailer must be equipped with a 2″ ball hitch & an electrical hook-up.